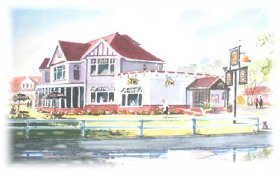 The Golden Bowler in Stubbington is one of the last traditional independent pubs in the area, owned and operated by our family for over 39 years. Why not relax in our Lounge Bar, a comfortable place to enjoy a glass of wine or one of our many gins. Dining is available in both our Bar and in our informal Restaurant with its cosy, pleasant atmosphere for locals and visitors alike. We hope you have a pleasant time with us, please feel free to borrow a book, read a newspaper or surf the internet with our free Wi-Fi during your visit. Built around 1920 as a private residence by local land owner Isaac Hammond, “Hillingdon House” travelled through various guises of residency under the Hammond ownership until 1966, when it was bought and converted to a private members club by Ron & Renee Clift and named “The Golden Bowler” after Ron’s retirement fund from the RAF. Another change in the mid 1970’s saw it become a Pub & Restaurant and in 1980 the pub was sold to Noel & Mary Pearce and partners. After 39 years, the pub remains in the family, with daughter Georgie & son-in-law Kevin at the helm since 2005.